Physical rehabilitation techniques have been thought to assist in correcting bruxism. The objective of developing or strengthening the jaw opening muscles is to 'hold the mandible in balance'. In one study a special facial exerciser was used to train the mandible muscles. The level of evidence on this and other similar techniques is extremely low and researchers have failed to provide plausible evidence of their efficacy. 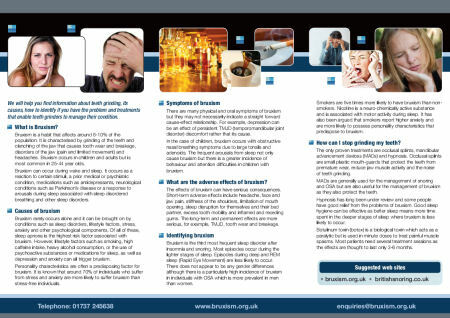 The use of medication in the management of bruxism has been studied but has relied solely on patients' reports. Drugs such as muscle relaxants have a temporary effect on jaw muscle activity, although the maintenance of their therapeutic efficacy, their long term tolerability and risk of addiction need further investigation. In fact, in one study, two thirds of the patients dropped out due to intolerable side effects. For most antidepressant drugs are not generally effective in reducing bruxism. Although one study found a small number of participants who clearly responded to the treatment. Other drugs such as sedative and anxiolytic drugs (drugs to treat anxiety) seem promising although the safety of their use is still in question as severe morning hypotension (low blood pressure) has been noted in 20% of patients. Botulinum toxin is a biological toxin which acts as a paralytic. Though it is highly toxic, it is used in minute doses both to treat painful muscle spasms, and as a cosmetic treatment. It is administered by intramuscular injection and the paralytic effects are thought to last 3-6 months. Recently, the therapeutic uses of Botox have expanded exponentially to include a wide range of medical and surgical conditions. This has been aided by a greater understanding of its underlying physiology as well as improved efficacy and safety. The evidence on Botox usage in non-cosmetic conditions of the head and neck is convincing and from research to date we should consider botox to be just as effective as other treatments. Avoiding stimulants (tea, coffee, cigarettes) for several hours before bed and maintaining a regular sleep schedule promotes better sleep. Better sleep means that more time is spent in the deeper sleep stages and less arousals occur. Bruxism occurs mainly in the lighter sleep stages. No studies into sleep hygiene as a successful treatment for sleep bruxism have been published. Biofeedback works on the premise that bruxers can 'unlearn' their behaviour when a stimulus makes them aware of their jaw muscle activity. It is thought that the patient can be trained to control the unwanted jaw muscle activities through auditory and visual feedback. However, these methods may be useful for daytime bruxism but their efficacy is doubtful in patients with sleep bruxism. The potential for continued sleep disruption and subsequent daytime sleepiness is high and therefore this technique is not considered a safe treatment.